Lake Hayes with it’s relaxed and romantic views is one of the most widely photographed in all of New Zealand. Hayes is situated on the Southern Island, in the valley of Wakatipu. This is an extremely beautiful place, surrounded by steep mountain slopes in the center of which is located Lake Hayes. It falls in the central part of New Zealand’s Otago area known as Central Otago. The nearest populated areas to Hayes are the pleasant Queenstown and the ancient town of Arrowtown. New Zealand is popular as a country with very beautiful natural resources, thanks to the various formations of nature that can be seen within a short distance. 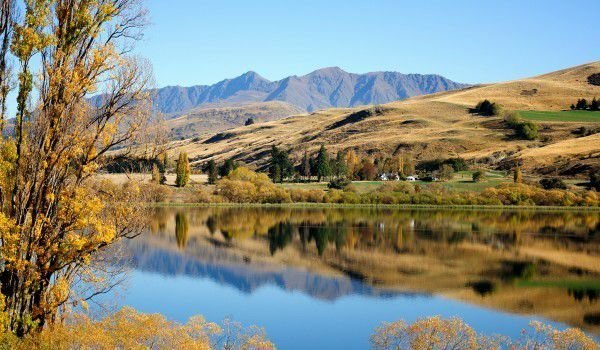 Lake Hayes is one of the most idyllic and tranquil places, which today is visited mainly for two purposes - a pleasant stroll and relaxing in nature and as an ideal location for weddings. Moreover, the region is widely used for wine production and visitors can visit any of the local wineries and taste the wine. Among the nicest places in the area of Lake Hayes is a fabulous mansion Stoneridge Estate, which is regularly used for wedding celebrations. Here the bride and groom have the opportunity to celebrate their dream wedding in a romantic stone chapel among the hills. The view at Stoneridge Estate, combined with the background of mountain heights and crystal waters of Lake Hayes is like a setting from a fairy tale. In the mansion there is also an art gallery, showcasing artworks of many famous artists from New Zealand. One of them is Peter Beadle. For lovers of good wine a visit to Amisfield winery is a must. Here the owners have taken painstaking care to make the production of wine an art that blends tradition and technology with the true spirit of New Zealand. The winery is located very close to the edge of the crystal clear waters of Lake Hayes, and visitors can always taste the best sparkling wines there. In the cellar of the winery a table can be booked in advance, where one can easily indulge in good food and quality wines, with friends. Lake Hayes and the majestic mountains that surround it complete the harmony of the experience. A walk along the natural watercourse is equally comfortable both day and night when the moon and stars are reflected in the placid waters. Hayes is situated only 21 km from the tourist city Queenstown, where there are countless opportunities for pleasant experiences. Arrowtown is a quaint little town that in the late 19th century grew due to gold mining. The name of Lake Hayes associated with D. Hay, who was an Australian, and came to these lands in 1856 in order to raise sheep. The name of Lake Hayes is sometimes associated with the local hero - Captain Bully Hayes.